Darren Chen, a Ph.D. student in computer science at UC San Diego, had just landed in Japan when he saw ads in the subway for the competition he was going to take part in. "I realized it was a big deal," he said. He might even have panicked a little, he admitted. In fact, the competition, called the RoboCup, brought more than 10,000 spectators and competitors to Nagoya, Japan at the end of July. The event, which is broadcast on Japanese TV, was celebrating its 20th anniversary. Chen was part of a team of Ph.D. students from the Contextual Robotics Institute here at the Jacobs School that was taking part in the event's RoboCup @ Home challenge. It was UC San Diego's first time taking part in the competition. In the @ Home challenge, 10 universities from around the world compete to complete a series of tasks by programming and training a Toyota Human Support Robot. The UC San Diego team had to sort groceries and help a person carry grocery items. In addition, they faced a task to qualify. On the fly, they had to program the Toyota robot to autonomously navigate and map out a room without bumping into people and objects. The robot also had to be able to obey verbal commands in a noisy environment. But the team's worst foe turned out to be the venue's WiFi. When 10,000 people were using the same radio band, it became difficult for the robot to communicate with other computers quickly. The researchers enjoyed the experience of participating in the competition, and look forward to continuing to build assistive robots in the future. 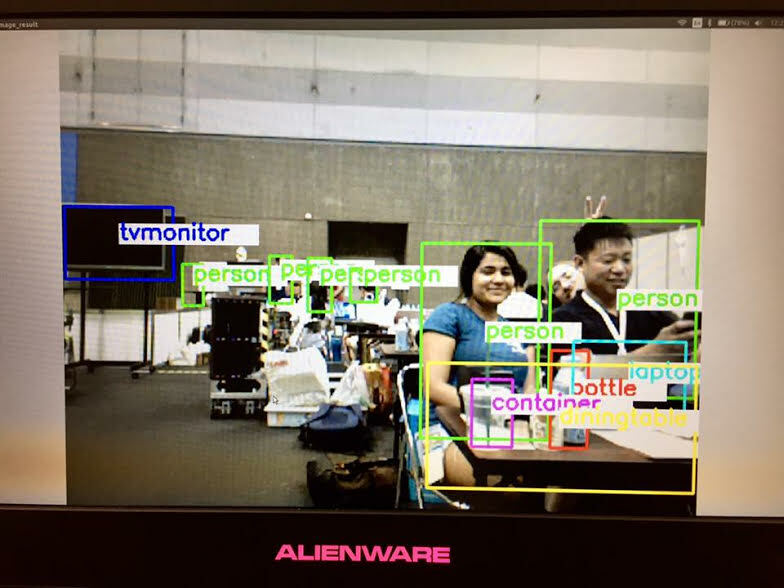 In addition to Chen, the team working on the RoboCup @ Home challenge included Angelique Taylor, Priyam Parashar and Ruffin White as well master's student Jaskaran Virdi from the research groups of computer science professors Laurel Riek and Henrik Christensen. Christensen is the director of the Contextual Robotics Institute. 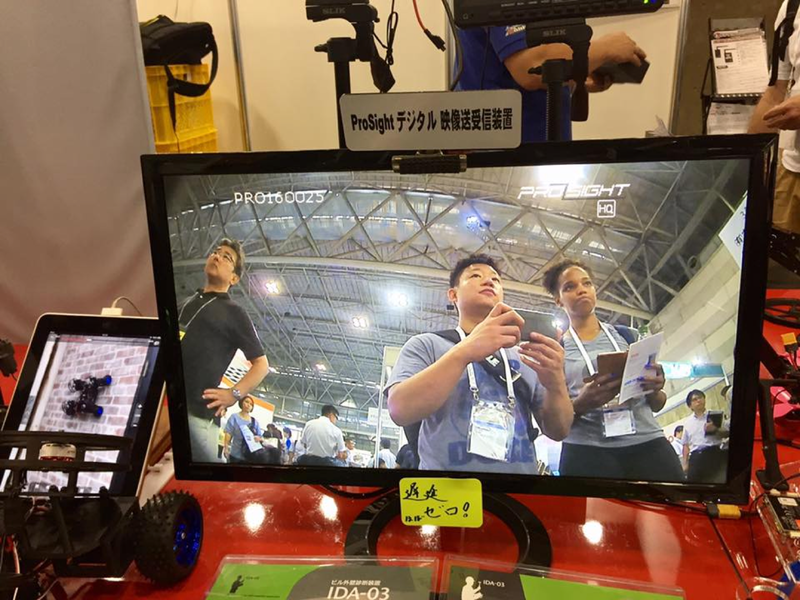 Two of the UC San Diego Ph.D. students taking part in the competition, as seen by the Toyota robot. Darren Chen, center, and Angelique Taylor, right, are two Ph.D. students in the research group of Professor Laurel Riek. 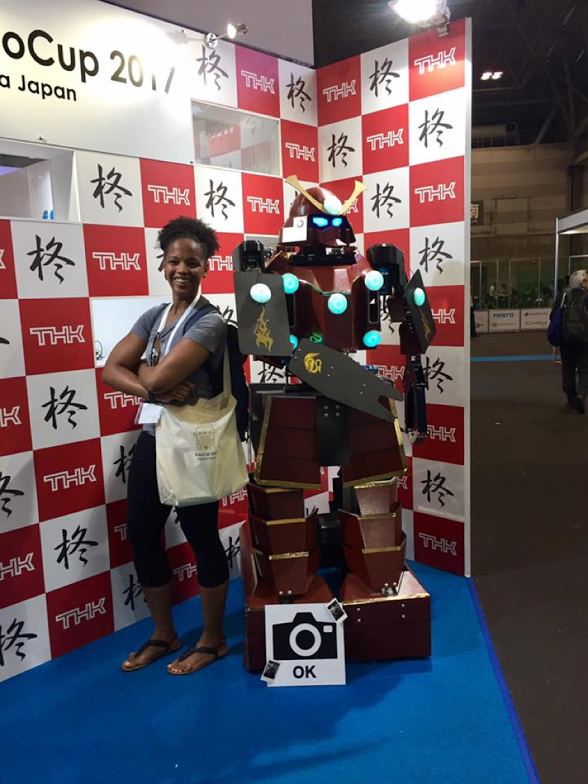 Taylor has some fun with the robots on exhibit at RoboCup. It's dark! And it's the middle of the day!